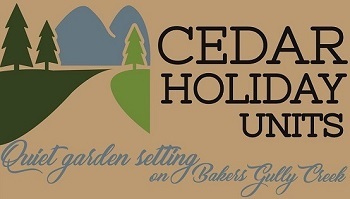 Cedar Holiday Units are nestled in Bright- tourism centre of North East Victoria, around 300km north east of Melbourne. Allow around 4 hours if driving from Melbourne CBD. Follow the Hume Highway to Glenrowan and then take the Milawa Gourmet Route for a pleasant drive through an area teeming in local produce such as wines, cheeses, mustards, nuts, berries, trout, honey and olives. Stock up for your holiday and carry on until you reach the Great Alpine Road, another tourist route which takes you through Myrtleford and then on to Bright. It is also possible to approach from Omeo and Gippsland over the Great Alpine Road through Dinner Plain and Hotham. Once in Bright turn right off the Great Alpine Road on to Anderson Street at the first roundabout. 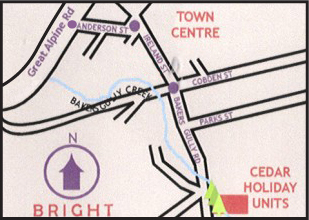 At the Clock Tower roundabout take the second exit onto Ireland Street which takes you to another roundabout where you go straight ahead on to Bakers Gully Road. The Cedar Holiday Units are numbers 40-42 on the left about 250 metres from the roundabout just after the school.